A bottle top dispenser plays an important role when it comes to dispensing a specified amount of reagent/chemical to carry out experiments that require high precision liquid handling. Mostly used in every industry, from Pharmaceutical and Healthcare to Life Sciences and Biotechnology, bottle top dispensers are known for their great aid in facilitating efficient liquid handling operations. 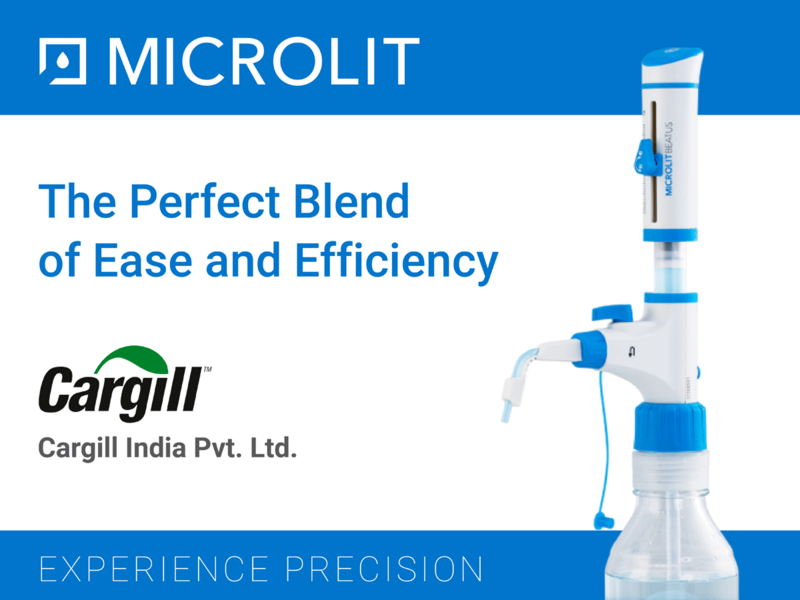 At Microlit, we offer a diverse range of bottle top dispensers – from the relatively simple and cost-efficient ones like Microlit Scitus with Springless ValveTM Technology to the more sophisticated ones like Microlit Beatus with Recirculation Valve and Springless ValveTM Technology and Microlit Ultimus with Dual InletTM Technology. Microlit Beatus with Recirculation Valve and Springless ValveTM Technology offers a blend of modern features and advanced functionality. Built by our in-house team of product design engineers, it uses Springless Valve™, an award-winning technology, and Recirculation Valve for preventing loss of reagent during purging. Microlit Beatus is also recognized by the India Design Mark as a product that exhibits good design and combines the best performance parameters with the best user experience. One of our coveted clients, Cargill India Pvt. Ltd., has been using Microlit Beatus for the past 2 months to conduct their everyday experiments on animal nutrition. The team of Cargill, comprising highly qualified professionals, reported that Microlit Beatus enables them to dispense solvents like Methanol, Chloroform, Sulphuric Acid etc. repeatedly throughout the day (approx. 20-30 times). They further added that it is easier and safer to use, as compared to what they were formerly using, thanks to its sophisticated yet highly ergonomic design. Apart from being cost-effective, the unique features of this high precision liquid handling instrument like Recirculation Valve and Springless ValveTM Technology, also add to its appeal. We are happy to share that the organisation has not reported any issue with Microlit Beatus during their usage period. It has tried and tested many bottle top dispensers and recommend Microlit Beatus with Recirculation Valve and Springless ValveTM Technology as one of the most fitting instruments for practical lab environments.